MANILA, July 31, 2014 – Proving its undisputed leadership in the consumer postpaid segment, Globe Telecom gets first dibs to offer the newest LG G3 with its suite of fully-customizable postpaid plans, once again giving it the edge in being the first telco to launch the latest devices to the Philippine market. Available at Plan 1799 with a P4,800 cashout, subscribers get GoSURF999 for 5GB of consumable mobile Internet, free calls and texts to all networks, free Gadget Care coverage for one month, and free six-month access to Spotify Premium, allowing users to stream and listen to over 30 million songs on mobile. With a Spotify Premium account, users can enjoy ad-free listening experience, play any song on-demand, listen to the highest audio quality, and download music and listen even on offline mode. “As the leader in postpaid and preferred telco partner of the world’s leading device manufacturers such as LG Electronics, we are excited to offer the LG G3 as part of our extensive device portfolio. With our brand new network, customers can maximize the features of LG G3 and enjoy sharing fast and living fast,” said Raul Macatangay, Vice President for Postpaid Business and Devices at Globe. Globe recently announced that its network already has 100% 3G coverage nationwide, and by end-September 2014, 100 percent 4G HSPA+ footprint, enabling faster and more seamless mobile browsing and quality call and text services. 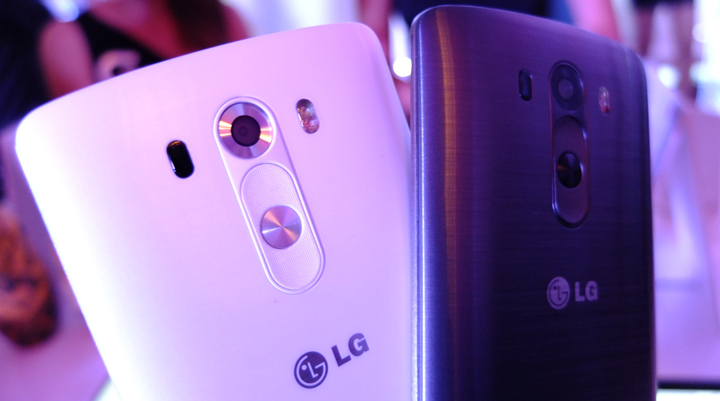 Prices above are based on info at LG G3 launch and pre-order promo. Coming from a successful 2013 with the triumph of the LG G2, Mobile World Congress’ most innovative manufacturer of the year continues to redefine smartphone with the LG G3’s “simple is the new smart” mantra. LG’s latest flagship smartphone takes pride in three core technologies—the sleek design, advanced display, and high-quality camera—providing a seamless yet “simple” user experience. The new Floating Arc shape makes the sides slimmer, allowing easy, one-hand control. The unit has been made more lightweight, too, for more carrying convenience. LG’s strong contender for 2014’s “King of Android”, the LG G3 also introduces Quad HD (with 538ppi pixel density), which produces sharper and more vivid images, four times than Full HD displays. The 5.5-inch display allows for better viewing at a screen ratio of 76.4 percent. The 13-megapixel camera includes the smartphone’s first Laser Auto Focus for fast and accurate auto-focusing, Optical Image Stabilization Plus (OIS+) for clear photos despite shaky handling and low-light settings, and the Dual LED Flash for vibrant images and balanced colors. More smart features like the Smart Keyboard (provides keyboard customization for user convenience), Smart Notice (gives suggestions based on user behavior), and Smart Security (offers enhanced security features like the Knock Code and Content Lock) have also been added to the new LG smartphone powerhouse. For such a reliable phone, get it with the network that empowers you. For more information about the LG G3,visit www.lg.com/ph, www.lgblog.com.ph, or www.LGnewsroom.com; like LG Mobile’s official Facebook page “LG Mobile Philippines”; or follow @LGPhilippines on Twitter and Instagram. You may also wish to read about the 5 Notable Features of the LG G3 Cameras and of course our Quick Review of the LG G3.